New FAA e-mails show air traffic controllers, pilots and even FAA officials were more concerned about safety issues surrounding bright lights at Levi’s and Avaya sports stadiums than previously acknowledged. As first reported by NBC Bay Area’s Investigative Unit in 2015, the bright lights have blinded pilots on final approach to land at San Jose Mineta International Airport. NBC Bay Area’s investigation showed Levi’s Stadium’s high-intensity lights and building-sized scoreboard were blinding and distracting pilots flying nearby. And just a few miles away, Avaya Stadium’s two-sided electronic scoreboard/advertising billboard blinded and distracted pilots while taxiing on taxiway Y and turning onto ramps C and B to the runway. Now, according to more than 100 internal FAA e-mails obtained under the Federal Freedom of Information Act, those concerns have been taken to a higher level. According to the e-mails, nearly 50 different pilots have complained about the safety issues associated with the lights at both stadiums. “This was not well thought out, and is a huge safety problem,” said one commercial pilot who summed up his frustrations in an anonymous report filed through NASA’s Aviation Safety Reporting System. The new complaint numbers show the FAA publicly downplayed the issue last fall when they released a statement saying only “a few” pilots had complained. According to internal emails, some inside the FAA believe the agency did not act aggressively enough to mitigate potential safety risks and even suspect the agency was possibly duped by the 49ers during early testing of the lights’ effects on pilots. NBC Bay Area’s 11-month investigation, based on both the emails and FAA internal reports, uncovered at least 42 separate pilot complaints regarding the lights and scoreboard at Levi’s Stadium alone. That’s more than six times the number of complaints NBC Bay Area was aware of when the Investigative Unit first broke this story in September 2015. The FAA remains tight-lipped about the situation, refusing to state how many complaints they’ve received in total. An FAA spokesman has also declined multiple interview requests from NBC Bay Area. The e-mails tell a more comprehensive story about these safety issues, detailing concerns about the stadium lights from within the FAA and the National Air Traffic Controllers Association. The records show factions within the FAA were pushing the agency to take more aggressive action. In one e-mail, the director of safety and technology for the National Air Traffic Controllers Association was blunt in his assessment of the FAA’s response to their concerns in an email to the agency before the stadium officially opened. A source intimately familiar with the stadium light issues through their work in aviation safety at San Jose's airport told NBC Bay Area that these problems have not gone away. The source asked to remain anonymous because of fears of retaliation. As noted, it’s not just the scoreboard at Levi’s Stadium that’s creating problems for pilots. The FAA’s internal e-mails also show a separate but related issue associated with the Avaya Stadium electronic scoreboard/billboard to be much worse than originally thought. Records obtained by the Investigative Unit show at least seven complaints regarding blinding and distracting lights from Avaya Stadium’s scoreboard, which is located directly across Coleman Avenue from the airport. Three of those complaints were filed with the FAA as recently as January 2016. In one e-mail, the FAA tower manager at SJC even threatened officials at Avaya in January to have the stadium’s lights turned off if she got future complaints. Within the records obtained by NBC Bay Area regarding the lights at Levi’s Stadium were two emails showing the FAA suspected the 49ers of duping the agency during an early test of the intensity and brightness of the lights. 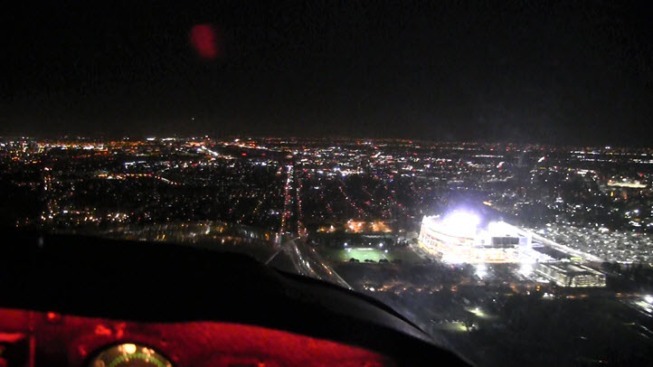 In July 2014, after receiving multiple pilot complaints concerning the lights and scoreboard, the FAA decided to perform its own test flight over the stadium to see just how bright those lights were. According to FAA emails, the agency coordinated the test with the 49ers, who were supposed to simulate game day conditions with the lights and scoreboards on full intensity. But later emails show the FAA suspected the 49ers didn’t live up to their end of the bargain. “Though we don’t have any hard evidence, we believe when we flight checked the lights and Jumbo-Tron, the stadium had the Tron on its lowest setting,” said FAA official Brian Durham in a September 2014 email. An SJC air traffic controller also had suspicions. The San Francisco 49ers declined interview requests for this story, but issued a statement addressing this issue. “We are not aware of any FAA flight tests that took place in 2014...The only dimming of our videoboards we have done was in early 2014 at the request of the FAA in conjunction with our initial testing and calibration. As an example of our cooperation with the FAA, we invited one of their safety representatives to be on-site March 2015 for WWE’s testing of lighting and fireworks for WrestleMania 31 and the event itself. We received no negative feedback from the FAA related to that event or any others since opening the building in 2014. Yet FAA records contradict some of these assertions. That WrestleMania (WWE) event which the 49ers say went smoothly - actually sent a pilot to a doctor to have his eyes checked. According to FAA records, the pilot reported he was forced to stare into the bright lights coming from the wrestling extravaganza while landing at SJC. Records filed with the FAA and obtained by NBC Bay Area show Kurowicki and her co-pilot filed a formal complaint about the incident. And despite claiming they didn’t know about this incident in its first statement to NBC Bay Area in September 2015, the e-mails show that on March 30, 2015 the FAA Tower Manger did know about the incident and referred to it directly. In addition to that incident, four additional pilots filed complaints after flying nearby in November 2014, months after the stadium opened in July. “Is anyone reaching out to the 49ers to express our concerns about the events that occurred last night?” FAA Public Affairs Manager Ian Gregor wrote in an email to SJC’s tower manager after that incident. It’s not easy to determine how many complaints have been filed by pilots about Levi’s Stadium because the FAA won’t publicly say and the complaints aren’t captured in a single database. The complaints are scattered across a number of sources, including internal emails, reported through NASA’s Aviation Safety Reporting System or filed as FAA Mandatory Occurrence Reports. It’s unclear if the records obtained via the Freedom of Information Act reflect every report filed by pilots, or if some are missing. NBC Bay Area recently filed several additional FOIA requests with the FAA after learning about other possible reporting mechanisms for pilots, but those records have not yet been provided. What’s clear is this: The number of complaints filed by pilots or the FAA about Levi’s Stadium and Avaya Stadium is significantly higher than first reported last year in NBC Bay Area’s November story. In addition to pilots who spoke to NBC Bay Area about the stadium lights, that story was based on five complaints filed through NASA and one additional complaint filed as a laser beam exposure incident. However, newly obtained FAA records show at least 41 pilots have complained about the Levi’s Stadium lights and scoreboard between May 2014 and May 2015. One 2014 email shows a single test of the scoreboard before the stadium opened caused 25 separate pilots to file complaints. A statement provided by the FAA last fall said the agency was unaware of any pilot complaints since 2014. Yet in March 2015, Kurowicki and her co-pilot were blinded flying over the WrestleMania event. And just one month later, in April 2015, emails show the FAA consulted with an attorney to determine if any criminal charges could potentially be filed against stadium operators for light incidents under a law designed to prevent lasers being aimed at aircraft. A later email shows they couldn’t because the law only applies to lasers, not other sources of bright light. In a written statement, the 49ers said they had no knowledge of those FAA discussions. Then in May 2015, the SJC tower manager also sent an email complaining about the strobe lights from a Levi’s Stadium Kenny Chesney concert, which she said could have been directly in the flight path of incoming air traffic. According to Santa Clara Mayor Lisa Gillmor, she was unaware of these problems until she saw NBC Bay Area’s September investigation while cooking dinner. “When I first saw the news story, I was a little surprised that it was an issue because I was not aware of it at all,” Gillmor said. Gillmor said the city hasn’t received any direct complaints and has not been briefed on any issues by the 49ers or the FAA since the team was initially calibrating the scoreboard. Gillmor said she would expect the stadium management company to work with the FAA if there were any issues. As first reported by the NBC Bay Area’s Investigative Unit in 2015, the bright lights have blinded pilots on final approach to land at San Jose Mineta International Airport. NBC Bay Area’s investigation showed Levi’s Stadium’s high intensity lights and building sized scoreboard were blinding and distracting pilots flying nearby. And Avaya stadium’s two-sided electronic scoreboard/advertising billboard blinded and distracted pilots while taxing on taxiway Y and turning onto ramps C and B to the runway. Now, according to more than 100 internal e-mails among FAA officials obtained under the Federal Freedom of Information Act (FOIA), those concerns have been taken to a higher level. According to the internal e-mails nearly 50 different pilots have complained about the safety issues associated with the lights at both stadiums. “This was not well thought out, and is a huge safety problem,” said one commercial pilot who summed up his frustrations in an anonymous report (LINK TO THIS REPORT) filed through NASA’s Aviation Safety Reporting System. The new complaint numbers show the FAA publicly downplayed the issue last fall when they released a statement saying only “a few” pilots had complained (LINK TO STATEMENT). According to internal emails, some inside the FAA believe the agency did not act aggressively enough to mitigate potential safety risks and suspect the agency was possibly even duped by the 49ers during early testing of the lights’ effects on pilots. NBC Bay Area’s 11 month investigation, based on both the emails and FAA internal reports uncovered at least 42 separate pilot complaints regarding the lights and scoreboard at Levi’s Stadium alone. That’s more than six times the number of complaints NBC Bay Area was aware of when the Investigative Unit first broke this story in September 2015. In one e-mail, the director of safety and technology for the National Air Traffic Controllers Association (NATCA) was blunt in his assessment (LINK TO EMAIL) of the FAA’s response to their concerns in an email to the agency before the stadium officially opened. A source intimately familiar with the stadium light issues through their work in aviation safety at SJC tells NBC Bay Area that these problems have not gone away. The source asked to remain anonymous because of fears of retaliation. In one e-mail, the FAA tower manager at SJC even threatened officials at Avaya in January (LINK To EMAIL) to have the stadium’s lights turned off if she got future complaints. Buried within the records regarding the lights at Levi’s Stadium were two emails showing the FAA suspected the 49ers of duping the agency during an early test of the intensity and brightness of the lights. The San Francisco 49ers declined interview requests for this story, but issued a statement (LINK TO FULL STATEMENT) addressing this issue. “We are not aware of any FAA flight tests that took place in 2014 and have no insight into any FAA discussions regarding criminal charges for lighting violations. The only dimming of our videoboards we have done was in early 2014 at the request of the FAA in conjunction with our initial testing and calibration. As an example of our cooperation with the FAA, we invited one of their safety representatives to be on-site March 2015 for WWE’s testing of lighting and fireworks for WrestleMania 31 and the event itself. We received no negative feedback from the FAA related to that event or any others since opening the building in 2014. However, newly obtained FAA records show at least 41 pilots have complained about the Levi’s Stadium lights and scoreboard between May 2014 and March 2015. One 2014 email (LINK TO EMAIL) shows a single test of the scoreboard before the stadium opened caused 25 separate pilots to file complaints. And just one month later, in April 2015, emails show the FAA consulted with an attorney (LINK TO EMAIL CHAIN) to determine if any criminal charges could potentially be filed against stadium operators for light incidents under a law designed to prevent lasers being aimed at aircraft. A later email shows they couldn’t because the law only applies to lasers, not other sources of bright light.